Life Vest Reviews – The NRS Chinook Fishing Mesh Back PFD is high quality life vest designed to be practical as well as life saving in the time of an emergency. Loads of pockets give the wearer plenty of places to put all of the fishing tackle they will need. It is made of high quality ripstop nylon with a 200 Denier urethane coating. 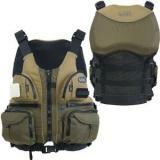 With its half mesh back and high flotation pad you will be very comfortable wearing the Chinook in a kayak.